I don’t make it a habit of sharing personal conversations on my blog, but when the individual you are exchanging ideas with happens to be James Cameron, it’s very difficult not to share (okay brag) a little. 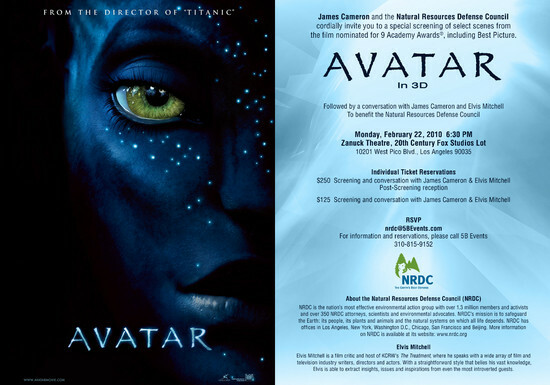 I was invited to a private Avatar screening on the Fox Studio lot, presented by James Cameron and the Natural Resources Defense Council (NRDC). The screening showed about an hours worth of the film, and focused on the strong environmental message throughout. James Cameron spoke after the film on the amazing reception the movie has made with environmentally conscious people. He discussed his passion for nature, technology, and much more (Have you seen his 3D undersea documentaries?). The irony that Avatar uses state-of-the-art “technology” to tell a story about “getting back to nature” does not get past him. It is this topic — “using technology to better the planet” that I was most interested in speaking with Mr. Cameron about. The screening was followed by a reception, where I got to meet and speak with Mr. Cameron for about 10 minutes. We spoke primarily about Augmented Reality, which played a large role in the making and marketing of Avatar. Coke, Mattel, and McDonald’s used Augmented Reality to integrate the Avatar brand into their cans, toys and happy meals. James Cameron also used AR technology in the filming of Avatar, to pre-visualize his actors within the CG scenes live, and in real-time. For those familiar with motion capture animation technology. Mr. Cameron pushed this further… creating a system that allowed him to observe on a monitor how the actors’ virtual counterparts interacted with the movie’s digital world in a real time environment. He was able to adjust and direct the scenes as if shooting live action, but in a computer generated world. Mr. Cameron and I started to speak about the power of entertainment and games to motivate people to action towards bettering the world, and this is where things really got interesting. It became clear immediately that this was our shared passion… to not only entertain and engage people… but to motivate people towards good. I shared a bit about my past projects like Superdudes, and the notion of “games with goals” really resonated with Mr. Cameron. It’s fairly clear that a movie like Avatar is a success because it delivers on many levels… beyond box office numbers, it entertains, and it gets people to think… and maybe even act! I would not be surprised if all the talk about the 3D technology and the enormous box office of Avatar are soon overshadowed by the message and impact of the movie itself on our society. Needless to say it was a great honor to be able to talk about things like augmented reality, technology, movies, games, and the environment with James Cameron. It is my hope that the work we do at Ogmento can make a similar impact with people the way Avatar did… delivering content that immerses people into a new world… entertains, engages, challenges…and as a bonus perhaps motivates people to take action and do their part in making the world a better place.